Where in the USA can you go to experience world class wines in a gorgeous setting, among friendly faces, and all without breaking the bank? Oregon’s Willamette Valley! After nearly a decade since my last visit, Oregon’s Willamette Valley has transformed from an up and coming wine producer to a globally recognized producer of complex Pinot noirs. But too much focus on Pinot may come at the expense of the AVA’s prowess and potential for Alsatian white varietals. The Willamette is home to fantastic whites and rosés, too. What I found when researching wineries is that grape diversity in the Willamette has decreased since my last visit. Sadly, most Willamette growers have chosen to specialize in Burgundian varietals – pinot noir and Chardonnay grapes. The finicky Pinot noir grape does make deliciously complex wines here. Most of the Willamette Chardonnays I’ve tried are more crisp, made with less oak or malolactic fermentation than their Northern California counterparts, with less fruit and more minerality – not unlike their Burgundian sisters. Meanwhile, Riesling and Alsatian white varietals still have a cult following here, but according to winery anecdotes, less acreage is devoted to these days. That is a great shame, because Oregon’s terroir and climate are well suited to them. Tasting room quality in the Willamette has improved immensely in 10 years. 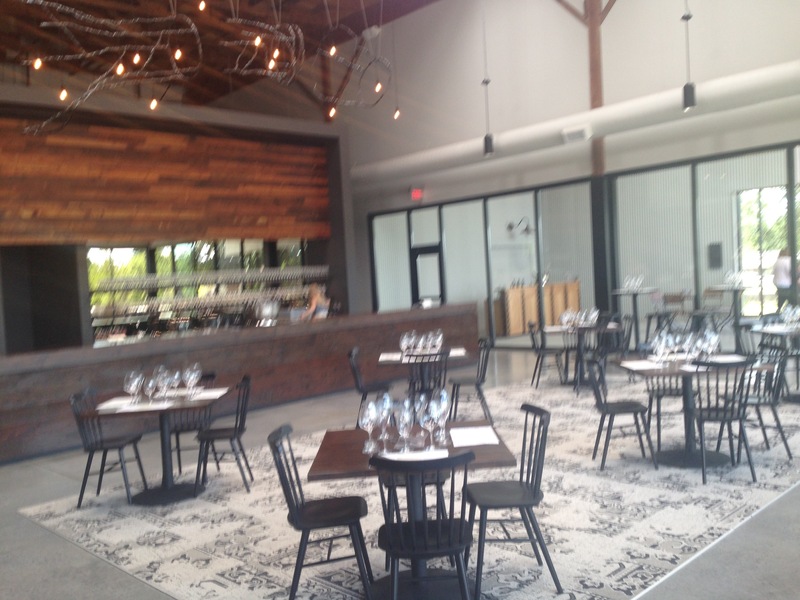 Many wineries have renovated or built new tasting rooms to accommodate the increased popularity of the Willamette Valley – and to keep up with California’s Napa and Sonoma Counties. Spacious, comfortable, and well decorated, one could easily spend the better part of a day tasting and relaxing either indoors or outdoors. Hospitable servers come directly to your table, happy to chat about more than just the wine. 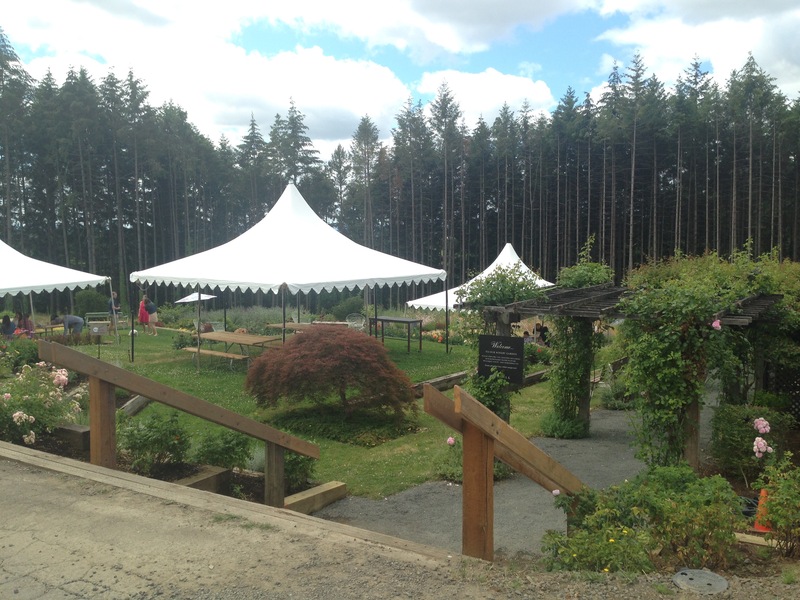 I’ll highlight three wineries we visited on this most recent Willamette wine tour. Rex Hill gained national recognition with its nationally distributed A to Z label, but wines bearing their Rex Hill label are higher quality and the focus at its tasting room. 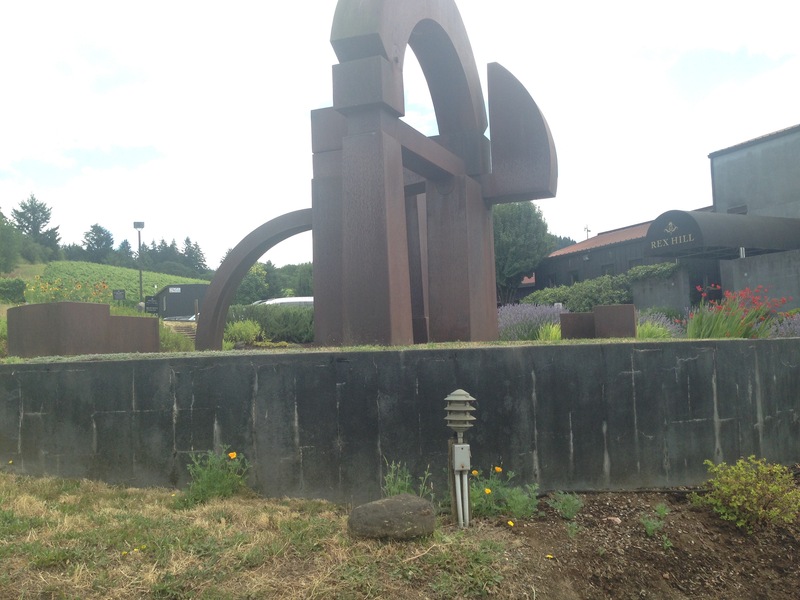 Rex Hill is known for its Pinot noirs. My favorite was the fruit forward La Colina Pinot, with its complex cherry notes and smooth, almost imperceptible oak. The Willamette Valley Pinot noir, their flagship wine, is spicier and more acidic, with a touch more oak, than the La Colina or Jacob-Hart. Rex Hill’s Jacob-Hart vineyard Chardonnay and Pinot noir are their crème de la crème wines. The Chardonnay is aged in 2/3 neutral French oak and 1/3 concrete vats – latter of which impart minerality. With a nice balance of fruit and minerality, it was smooth and drinkable. It almost felt like a Burgundian Chablis, but with less smoke and more New World fruit. The Jacob-Hart Pinot noir had more noticeable bright acidity and complexity. The Rex Hill staffer noted that these grapes fought their way to harvest growing in one of the rockiest vineyards in Oregon. Looking for a nice summer wine, we took home a bottle of Rex Hill’s rosé. It was drier than many American rosés, with notes of dried strawberry and cherry. It made for a refreshing post-dinner sip. 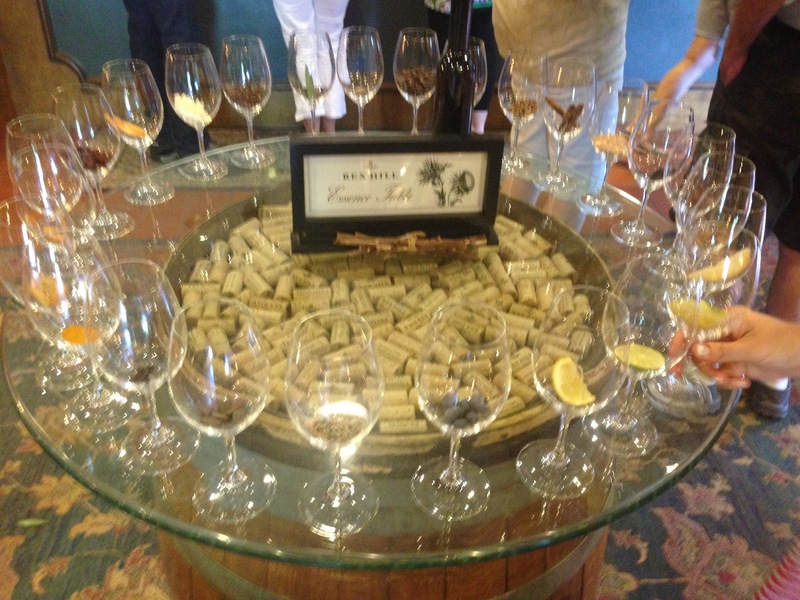 My favorite aspect of Rex Hill’s tasting room was its display of various aromatic notes typically found in wine. Dried fruit, flowers, herbs, minerals, and organic matter (ok, dirt) in individual glasses help give visitors a real vocabulary for wine. Argyle specializes in sparkling wines and the still wines made from sparkling wine varietals (Chardonnay, Pinot noir, and Pinot meunière). Their new (2015) tasting room, created from their old winery site, is a study in architecture and ambience. I described it as “Chip and Johanna’s tasting room” (from the HGTV show, “Fixer Upper”. Reclaimed wood from the winery, open and airy, high ceilings, geometric patterns and sleek rugs, deep teal bathroom paint made me happy. 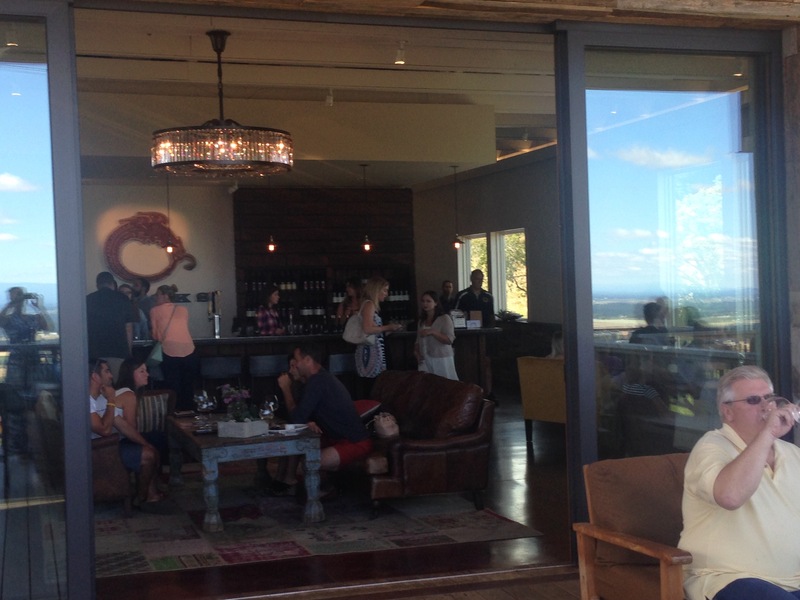 Despite the sleek modernity of the tasting room, tastings are relaxed. Patrons have choice of three flights with three (2 oz.-ish) tastes each. Looking around at our fellow tasters, everyone seemed seemed relaxed and happy. Each of the four sparkling wines we tried were solid. The Knudsen Brut (90% Pinot noir, 10% Chardonnay) and blanc de Blancs were especially fantastic. Looking at their list of still wines, I was sad not to taste some of them, but I was able to snag a taste of their dry Riesling and their late harvest Riesling. 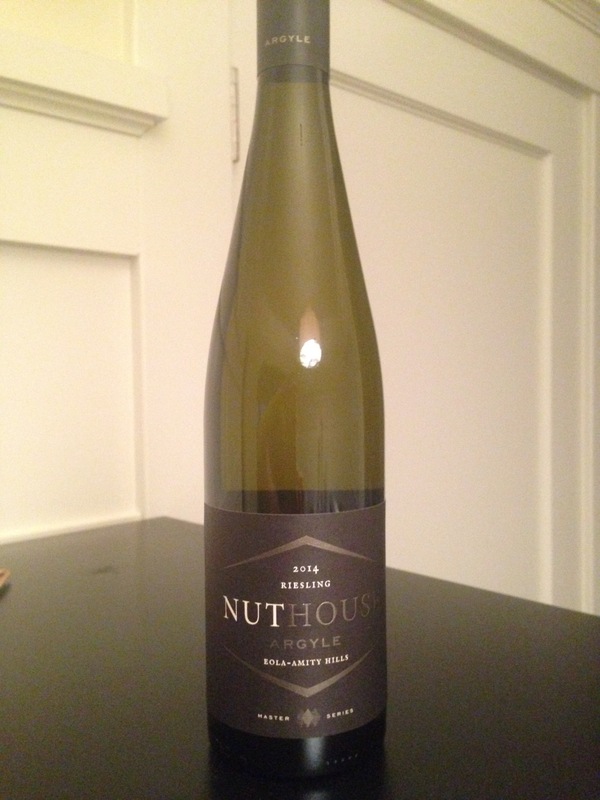 Their Nuthouse (named after a hazelnut production facility) Riesling was medium-bodied, dry and deliciously smooth and slightly complex with honeysuckle and minerality. The late harvest was slightly syrupy but definitely a sweet ending. Brooks winery was by far my favorite of the day. 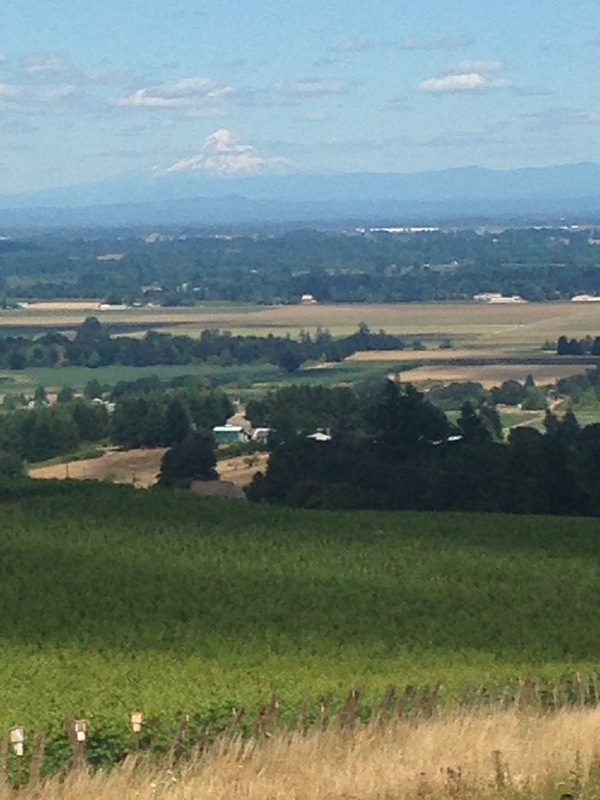 Its hillside location offers stunning views of much of the Willamette Valley and beyond, including the property’s vineyards, farmland, and distant mountains, including the volcanic Mt. Jefferson, Mt. Hood, and Washington State’s Mt. Adams and Mt. St. Helens. 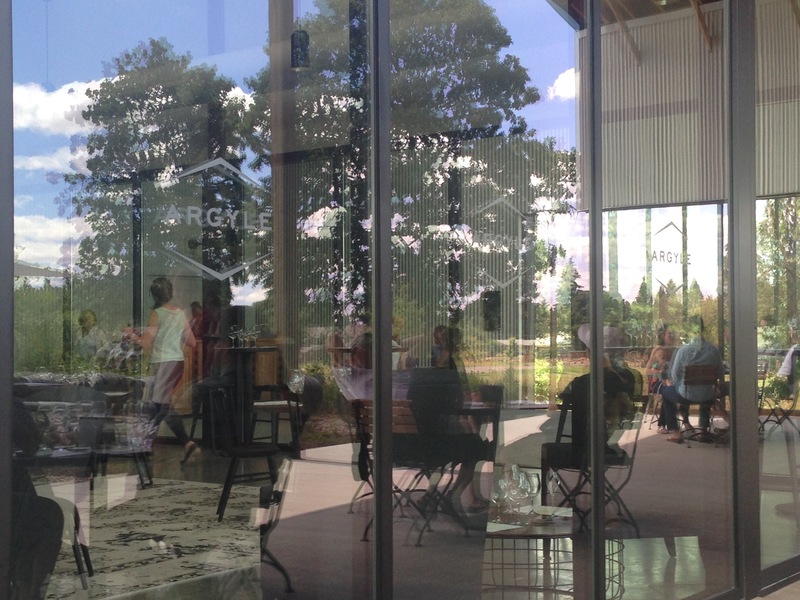 The tasting room was eclectic and modern, the patio expansive like a (wealthy) friend’s living room and deck. The wines, with names inspired by world mythology, were fabulous. If you’re a frequent visitor, wines are available by the glass or bottle. Newbies can sample flights from three options: six whites, six reds, or a selection of three of each. I chose the Isis flight of six whites. The Amycas white is a blend of the four major Alsatian grapes: Pinot blanc, riesling, Muscat, and Gewurtztraminer. The crisp Pinot blanc (a less-known Pinot noir mutation) brings to mind the minerality of Central European whites. 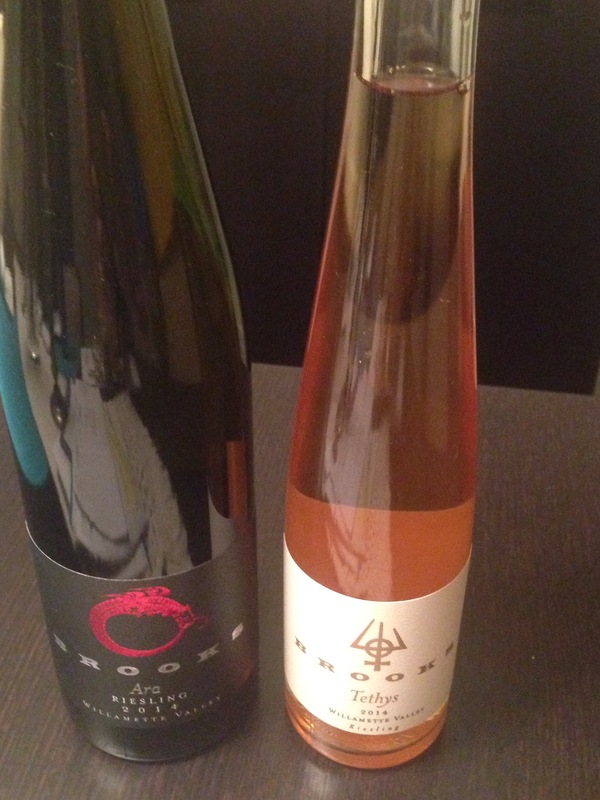 Brooks is well known for its varied Rieslings, which range from dry to sweet and dessert. I tried the Ingram Road dry, Sweet P off-dry/semi-sweet, and Tethys dessert versions, though several other styles are off-menu, including the 2014 Ara Riesling. The White House put an earlier vintage of the Ara on the map when it was served at President Barrack Obama’s first state dinner. Each Riesling was a refreshing departure from its predecessor. The dessert wine was fantastic and complex, extremely rich and great paired with cheese. The red Artemis flight highlights six Pinot noirs. From Brooks’ crisp rosé of Pinot noir to the delicate, mineral-laced Terue (made from grapes grown along the Columbia River Gorge) to the bold Runaway Red Pinot noir, Pinot lovers will find plenty of nuance to enjoy. For those in need of a nibble, Brooks has a menu of small bites, including a Marcona style hazelnut (roasted with rosemary and sea salt) and a tasty cheese plate with Oregon cherries, olives, roasted hazelnuts, and crostini. Overall, our 2016 Willamette Valley wine day proved to be a perfect tour. 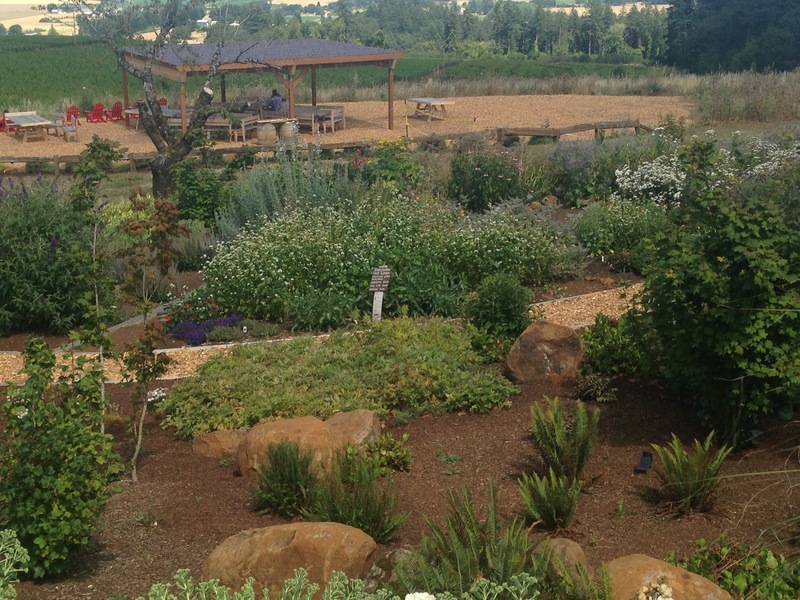 Make the Willamette Valley the destination for your next wine excursion! What a great blog! I enjoyed this article immensely – we’ve been to Willamette several times but you added some new labels to our must-visit list. I also loved your article on Gloria Ferrer, which is close to our house (about 8 miles) and special to me because I have dual Spain/US citizenship and my mother’s side of the family hails from Spain. Check out our wine country blog and follow us if you like what you see: http://www.topochinesvino.com.